The Moeraki Boulders or big naturals are among the top tourist attractions in the South Island's East Coast near Oamaru in New Zealand. 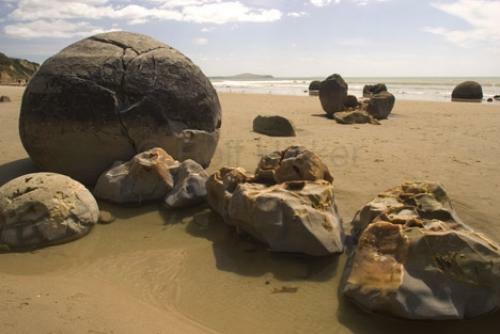 These Big Naturals, the Moeraki Boulders, are an anomaly along the South Eastern coast of New Zealand near Oamaru. It has never been proven exactly how these almost perfectly round boulders came to be on the beach at this one location.